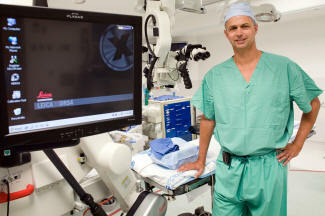 Dr. John Ruge has an outstanding national reputation as both a pediatric and adult neurosurgeon. Areas of expertise include complex pediatric and adult brain tumors, spinal tumors, Chiari malformations and syringomyelia. He has over 20 years experience in treating children and babies with head shape and size problems and utilises a team approach in treating complex craniosynostosis. He cares for patients of all ages with hydrocephalus, tethered spinal cords, and head trauma. He is experienced in using Gamma Knife and Cyberknife.